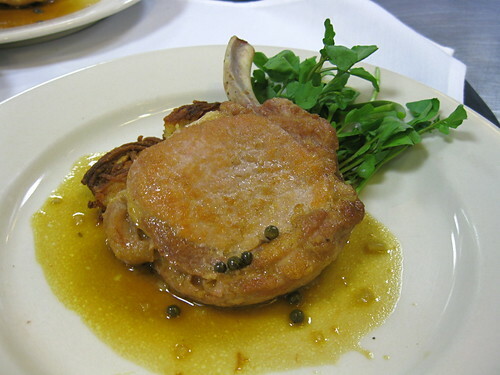 Saucier Dish - Pork Chop with Green Peppercorn Sauce. This was the first time I made it and the sauce was a little thin. 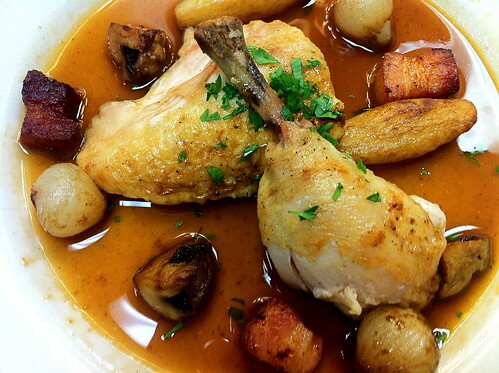 The Pot au Feu debacle had not been great for my already low morale. With the midterm so close, it definitely sent me on anxiety spiral. Then weirdest thing happened. A couple of day before the practical, all my anxiety just burned off as if it had been a fever. The weekend before the midterm, I practiced like I always do. I was most worried about the Saucier dishes, so I focused on practicing the ones that I thought were most likely to turn up on the exam. I made the Chicken Grand Mere and the Lemon Tart for friends visiting from out of town. Then the Monday night before I made the Pork Chop for Greg. The strange thing was that there was no worrying while practicing. Sometime on Sunday, the stressing just stopped. It was totally unlike me. 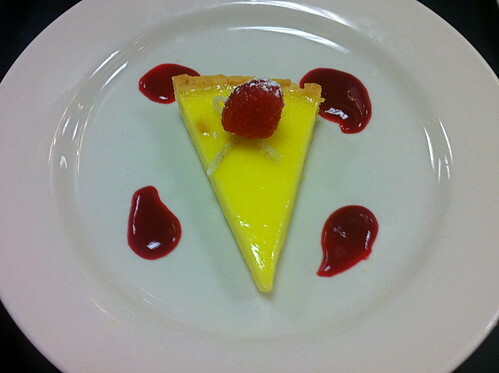 Patissier Dish - Lemon Tart. I felt like Ron Livingston in Office Space after he got hypnotized into not caring about his job. I mean, I still cared about doing well, but without all of the unnecessary, self-imposed head-drama. All of the words of wisdom I’d heard from people magically sunk in over night. Greg liked to remind me that the chances of my actually failing completely were pretty unlikely. Now I actually believed him. Friends suggested that maybe if I could manage to breathe whenever I’d start to flustered rather than panicking, maybe my hands wouldn’t shake and maybe, just maybe, that might make it easier to keep working and plate more efficiently. I started to think that I might be able to do that. I staid so calm that I managed to not to pick any fights with Greg over the weekend. Insomnia didn’t even get the better of me the night before. 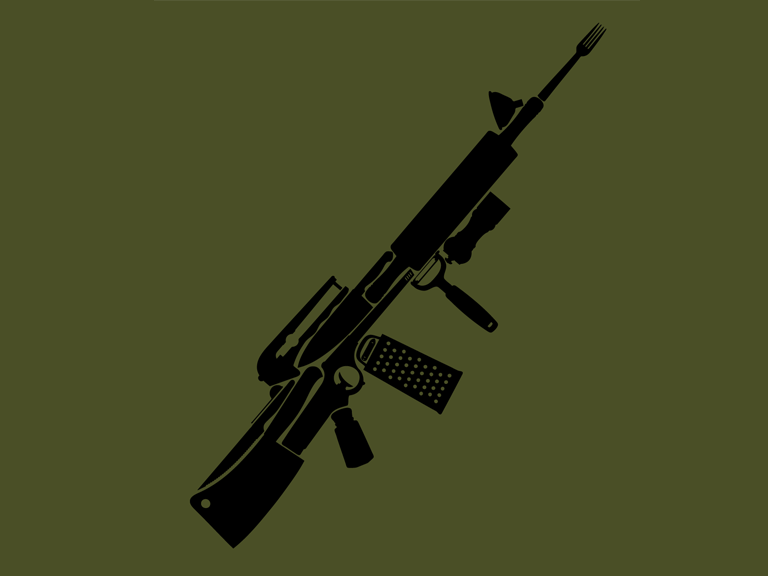 I woke up the day of the midterm, put on my new Kitchen Warfare t-shirt for good luck and to show I meant business, and I felt good to go. Maybe the best piece of advice I got came from my friend and classmate, Julia. She told me that when she was learning to ski she used to get really tense and nervous, so someone told her that she should sing “The Lady in Red” to herself whenever she felt herself start to tighten up. That slowly swaying rhythm that makes it such a perfect song for middle school dances also makes it really difficult to stay tweaked out while singing it. So I sang my little heart out. That’s right. Every time I started to get tense, I sang. I was hoping to draw Poissonier/Patissier in a later position, so of course I drew Garde Manger/Saucier in position 1. The Lady in red is dancing with me. No big surprise really, I drew position 1 or 2 in almost every mock-midterm. Cheek to cheek. The potatoes for the Niçoise Salad overcooked a little bit and are now on the fragile side. There’s nobody here, it’s just you and me. Just be extra careful while shaping them into rounds. It where I wanna be. Only a few minutes left to get all of these salads plated. I hardly know, this beauty by my side. Salad’s done, now time to move on the sauce for the pork chop. So glad I practiced it last night. I never will forget . . . Ok, not sure this thermometer is working. No idea if the chops are raw or overdone. . . .the way you look . . . Gah! But gotta get them up there. . . . tonight. And done! Whatever will be, will be. 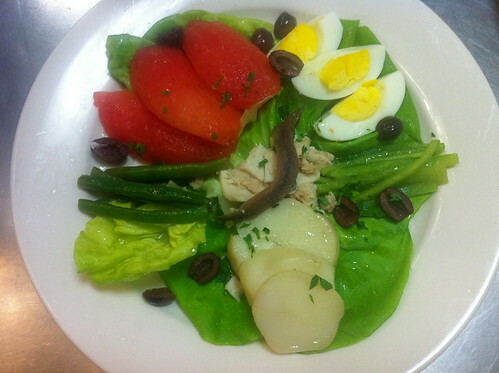 Garde Manger Dish - Salade Niçoise. Came out a little hazy, but taken after the midterm. Actually, the anxiety did creep back in for a little bit after I got the plates in, because I really had no clue to what point the chops were cooked. It’s very possible that I turned some overdone and some underdone. Damn that new thermometer! Whatever the state of the chops, I got all my food in on time, plated fairly well, and while I think that some things were under-seasoned, I’m pretty sure everything was hot -- and that was enough to just pull an A on the exam. 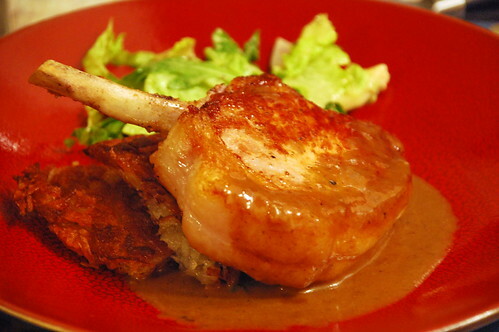 Saucier Dish - Pork Chop - Practiced at home. On to level 4! The best part is, no more practical exams until the final in level 6, so I get two whole levels to allow my developing ulcer to heal. I would like to thank the Alien that clearly took control of my body and kept me in relatively relaxed state throughout the midterm. I’d like to invite you to stick around for a while. Cut and Burn Count: No major cuts to report. Too many little burns to keep track of, but there were two kind of gnarly burns during level 3. How did I get these nasty boys? A rogue light bulb in one of the lowboy fridges got me twice.